Making Medical Lab Quality Relevant: Accreditation, Consultant, Laboratory Disconnect. In the previous entry I mentioned that we were putting on a survey about a Technical Report written by ISO to assist in the implementation of the standard on Quality and Competence for medical laboratories. The power of on-line surveys is how rapidly people respond. By 24 hours we had almost 50 percent of our target audience numbers. As I took an early look at the information one question jumped out. A cautionary note before proceeding. We had no control over who would and would not respond, so from my perspective that makes the audience a random selection. Second, and I will have to check with my son, the math/statistics guru, to validate this, but in my experience with these surveys, once you have more than 15-20 percent of the audience pattern responses by and large are set. So while we will continue to collect information, the early impressions are likely (but not assured) to remain fairly consistent. So one question asked if the responder was aware of the Technical Report, and how well they knew it. There were 4 choices: (a) I know of it, have read it and use it regularly- RED, or (b) I know of it, have read it, but don’t use it- GREEN, or (c ) I know of it, but have not read it - BLUE or (d) I am not aware of it - BLACK. 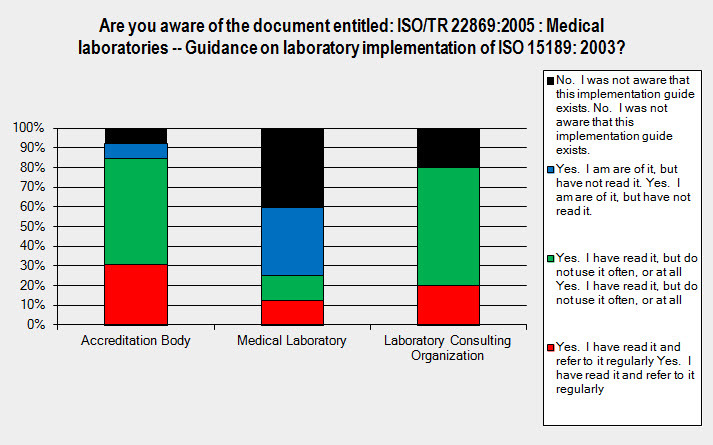 In the graph below, you can see how three groups responded: people that work in laboratory accreditation, people who work as laboratory quality consultants, and people who work in laboratories. What I found interesting is that in this early cut, of people working as consultants or as accrediters, about 80 percent had aware and had read it, however for people working in laboratories that group dropped down to about only 25 percent. Considering that the document was intended to be used by laboratory people, it would seem that the ISO committee had missed its target audience by a large margin. This could be interpreted in a number of ways. The most likely response is that for people who work as consultants or as accrediters, it is their business to know about these documents, and they are more likely the ones with the time to read. So we might even think that having 20 percent not being aware of barely aware says there is a problem. On the other side, laboratory folk usually don’t go looking for Quality standards unless they are planning to make a shift to a formal Quality program. So we might think that having 25 percent awareness is pretty good. But another, perhaps more concerning interpretation, is that the folks at ISO may be missing a big part of their mission. There is no doubt that ISO is the “top-of-the-heap” when it comes to standards development, but it is also likely that when it comes to marketing the product they stink. If the target audience is not finding or using your documents , then why spend all that money and time and energy if you don’t plan to let people know. But consider, if there are about 5-10 accrediting organizations, and maybe 100 consultants and 25000 laboratories. getting a lot of response from the former two and not the latter is kind of missing the point. Imagine if General Motors, or Ford, or Hyundai took that approach to car manufacturing. “Our cars are so good that we don’t have to advertise. Folks will just beat a path to our doorstep. We will save a ton of money”. NOT. There are organizations that don’t need to advertise. Organizations like government run hospitals, or government run schools. They just have to exist. People will find them; and if they don’t it will take government 50 years before they will decide to shut them down. But the private service sector can not work that way. If you don’t let people know that you have a door, or where the door is, then it is pretty hard to beat the proverbial path. Is it any wonder that standards development is not the way that people or organizations make their millions? And when they do, you can be pretty assured that they spend a lot of time and energy keeping their name in the face of every target audience they can find. Marketing is not the only thing, but its too important to be left to luck and the good will of others. Message to standards developers: if you are in business, then do what business does. Identify your target audience and then go after them aggressively. Be a business. And if you would rather be “above” all that, then don’t come back to your volunteers whining about the poor response and your weak finances. If the pattern changes with more responses, I will comment again.